Dong Thap (VNA) - The People’s Committee of Dong Thap province has directed relevant agencies and district authorities to ensure farming of white-leg shrimps in freshwater areas is not expanded since the saltwater discharged by these farms affect water bodies and crops. White leg shrimp was traditionally farmed in the sea, but in the last three years many inland farmers, seeing the crustacean offers good profits, have exploited groundwater and added salt to it to farm it. Some households earn a profit of 50,000-80,000 VND per kilogramme, persuading many others to follow suit. But the farms discharge their salinised water into the environment, causing authorities to worry about its effect on rice cultivation and farming of freshwater species. Besides, white-leg shrimps are vulnerable to diseases, and the larger the area in which they are farmed, the higher the risk of disease outbreaks. According to the Government’s master plan for the fishery industry until 2020, Dong Thap is not in the list of localities zoned off for white-leg shrimp breeding. 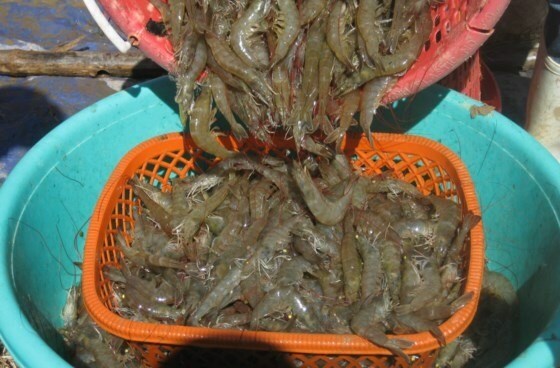 Though authorities have urged farmers not to breed white-leg shrimps in freshwater areas, the creatures are being farmed on around 150ha in Tam Nong district. Chau Hong Phuc, deputy chairman of the province People’s Committee, said his administration has instructed the Department of Natural Resources and Environment and other agencies to intensify checks and get tough on violations related to exploiting groundwater to farm the shrimps and instruct breeders to only discharge treated wastewater into the environment. It has also assigned them to analyse and assess production and profit, and the impacts on the environment and other agricultural production in Tam Nong district. The local Department of Science and Technology will study the breeding of white-leg shrimps in freshwater areas to assess the adaptability and short- and long-term impacts on agricultural production, the eco-system and bio-diversity.